It is often suggested that habitat attributes and interspecific interactions can cause non-random species co-occurrence patterns, but quantifying their contributions can be difficult. Null models that systematically exclude and include habitat effects can give information on the contribution of these factors to community assembly. In the boreal forest, saproxylic beetles are known to be attracted to recently burned forests where they breed in dead and dying trees. We examined whether species co-occurrences of saproxylic beetles that develop in, and emerge from, boles of recently burned trees show non-random patterns. We also estimated the extent to which both the post-fire habitat attributes and interspecific interactions among beetles contribute to such patterns. We sampled tree boles encompassing key attributes (tree species, tree size/dbh and burn severity) that are thought to characterize species–habitat associations of saproxylic beetles, a proposition that we tested using indicator species analysis. Two null models with no habitat constraints (“unconstrained”) indicated that a total of 29.4% of the species pairs tested had significant co-occurrence patterns. Habitat-constrained null models indicated that most of the detected species aggregations (72%) and segregations (59%) can be explained by shared and distinct species–habitat relationships, respectively. The assembly pattern was also driven by interspecific interactions, of which some were modulated by habitat; for example, predator and prey species tended to co-occur in large-sized trees (a proxy of available bark/wood food resource primarily for the prey). In addition, some species segregation suggesting antagonistic, competitive, or prey–predator interactions were evident after accounting for the species’ affinities for the same tree species. 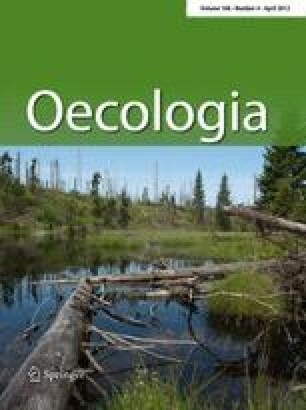 Overall, our results suggest that an intimate link between habitat and interspecific interactions can have important roles for community assembly of saproxylic assemblages even following disturbance by fire. We also show that a systematic application of null models can offer insight into the mechanisms behind the assembly of ecological communities. The online version of this article (doi: 10.1007/s00442-011-2180-0) contains supplementary material, which is available to authorized users. We thank Chantiers Chibougamau and Barrette Chapais Ltée for logistical support, and F. Bélanger, S. Bélanger, J. Boucher, S. Bourque, C. Buidin, C. Caron, M. Couture, M. Huot, O. Jeffrey, Y. Rochepault, A. Sanfacon, M.-C. Saulnier, J. Simard-Nadeau and M.-A. Valiquette for their help in conducting the field work and in sample sorting. We are indebted to Y. Dubuc and G. Pelletier for specimen identification. This paper has benefited greatly from the insightful comments and suggestions made by C. Boisvenue, Y. Boulanger and three anonymous reviewers. We also thank P. Cheers for revising the English. This study was supported by the Fonds de recherche sur la nature et les technologies and the Ministère des Ressources naturelles et de la Faune through the Programme de recherche en partenariat sur l’aménagement et l’environnement forestiers-II, by the iFor consortium (Université Laval), by Environment Canada, by the Canadian Forest Service, and by la Fondation de l’Université du Québec à Chicoutimi.